I’d walked into my local gun shop to drop my Browning over/under in for a well needed service. Over the previous few years I’d really got into shotgun shooting and had started to put together a small library of old shooting books, which of course had in turn required a nice glass fronted book case to keep them in. I’d reserved the bottom shelf however for some old curios. The only problem was it was looking a little bare, with only my late grandfather’s old Bolex cine camera on display. Whilst the RFD was taking down my licence number and making a note of the work my Browning required I saw the unmistakeable shape of a “Webley” under the counter. I’d only ever seen pictures of these air pistols before and was stuck by how small and elegant it looked. It would sit perfectly alongside the old camera. However as a PhD student on a stipend I didn’t feel I was in a position to make such an impulse purchase, so I left my Browning and the Webley in the shop. The following week saw me taking a holiday with my girlfriend’s family in North Norfolk. Normally I spend very little time on my phone and there was no signal where we were staying anyway. However I couldn’t get the Webley out of my mind and I had to do some research somehow. Her family must have thought I was very polite volunteering to go to the farm shop every morning to buy things for breakfast and lunch. However truth be told I was there for the free Wi-Fi, desperate to find out more about the pistol. Was it a Tempest? A Hurricane? I hopped not as they aren’t suitable for lefties like me. Perhaps a Junior or a Senior? It was hard to tell from the tiny photos I found online in the 30 second snippets I had each morning between the rare breed meats and locally made jams. At the end of the week however I’d come to a decision. If the Webley was still there, and could be shot by a leftie, I was having. And it was. And it could be. So I did. One thing became clear very quickly. Although I’d made a nice wooden display stand for it, this Webley Premier definitely wasn’t going to be an ornament! Although I had quite a bit of experience with air rifles and shotguns, pistols were new to me. Paper punching at 10 yards didn’t really appeal, and as the pistol was in .22 it was begging to bully some tin cans. I had a quick rummage through the recycle bin and set out targets at 10, 15 and 20 paces. The first thing that struck me was how nice the trigger was. 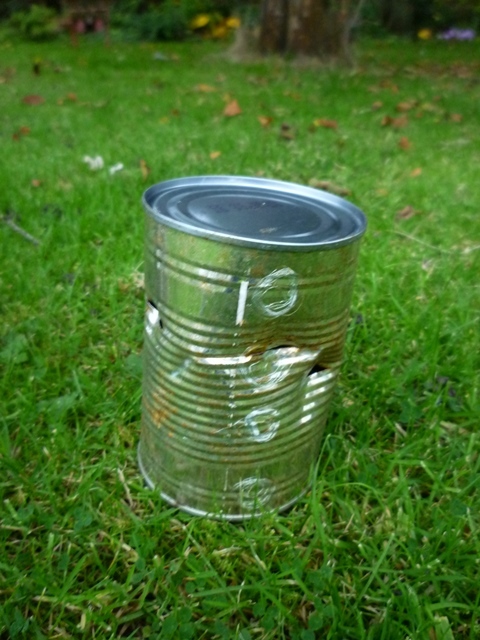 After some sighting in shots I was able to hit the can at 20 paces about as often as I missed. Something that became obvious to me very quickly was that most pellets I put in the barrel seemed to drop forward rather than sit flush with the breach. Some research revealed that this was a 5.6 mm barrel rather than the now common 5.5 mm. Further research revealed there are 3 pellets on the market which could be suitable for my gun. These are the Defiant Vintage, No. 2 Bisley Wasp and Marksman 5.6 mm. The Defiant pellets fitted into the breach like a dream and shot very well. The only real downside to these is the cost. I was also pleasantly surprised by the Bisley Wasps, which were an economical alternative although they do benefit from a good wash to remove lead swarf from the manufacture. Finally I tried the 5.6 mm Marksman pellets. I really wanted to like these as I had read good things. However the batch I received seemed to be badly oxidised and dropped into the barrel like a 5.5 mm pellet which was a shame. ​In the end I stuck with the Defiant pellets and was very happy with my choice for a few months. However I started to notice a deterioration in accuracy that cleaning the barrel wouldn’t solve. Furthermore inspection of my backstop showed that some of the pellets were hitting sideways, suggesting that they were tumbling in flight. I wondered if this was due to a lack of velocity necessary to keep the bullet shaped Defiant pellets flying straight so I went back to the diablo shaped wasps. 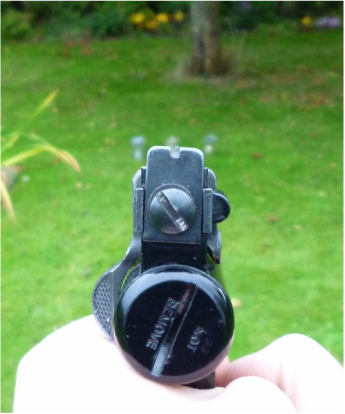 The drop in pellets at 15 yards was alarming and it was obvious a good service and some replacement parts were needed to give the pistol a bit more power again. Fortunately spares for Webley pistols are readily available and so I decided to replace all the possible culprits in one go. A new breach seal, piston seal and spring were fitted. To preserve the history of the gun I kept the original parts safe. I also thoroughly degreased the internals and applied a sparing layer of new gun grease to the piston and spring. Now Webley’s are infamous for their wobbly barrels and so I thought I’d try and tighten mine up again by replacing the barrel joint screw. This turned out to be a nightmare job as it was so tight I had damaged the head of the old one getting it out for disassembly. When I came to install the new one I discovered the threads in the gun had been crossed at some point and the new one wasn’t going in. To my shame I tried to recut the threads and made things a lot worse than they were. Fortunately Mark Knibbs from John Knibbs International Ltd where I had bought the spare parts from was an absolute gentleman and repaired my mistake without charge. I finally had a fully working Webley again, and it has shot several hundred pellets again since its ordeal. I’ve deliberately avoided talking about the history of Webley pistols, commenting on the novel cocking system or showing pictures of pellet groups. The Premier is 20 years older than me and to do so would just be repeating the work of numerous writers who came before. Instead I wanted to share the story of my first Webley. Whilst I can see how people get into collecting these guns, to me the fun is in using them to. 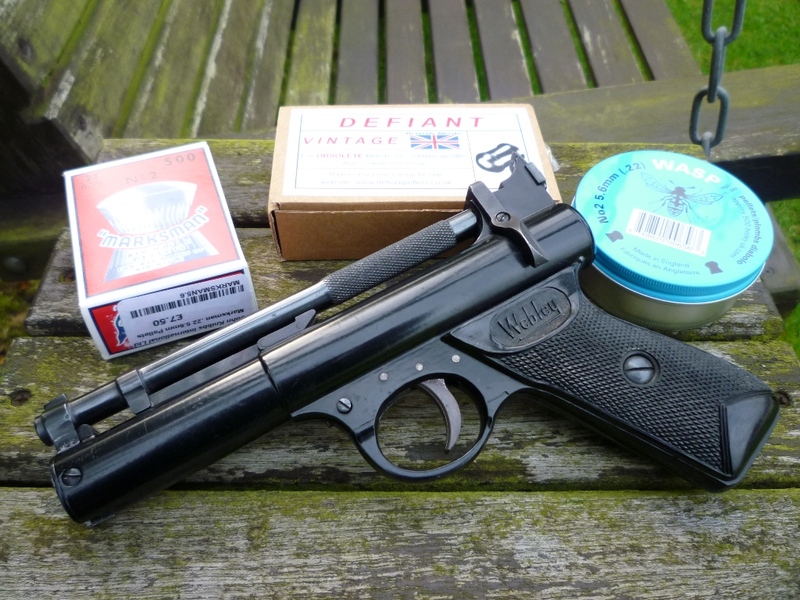 There are some much earlier Webley air pistols than mine, and I hope that it will continue to shoot for many more years to come.